Also free use of the stunning new Aqua spa at the nearby China Fleet club. 2 adult & 3 child memberships included. Other guests just pay a guest fee. Golf Breaks. Free unlimited golf costs just £80 per couple per week (see below). 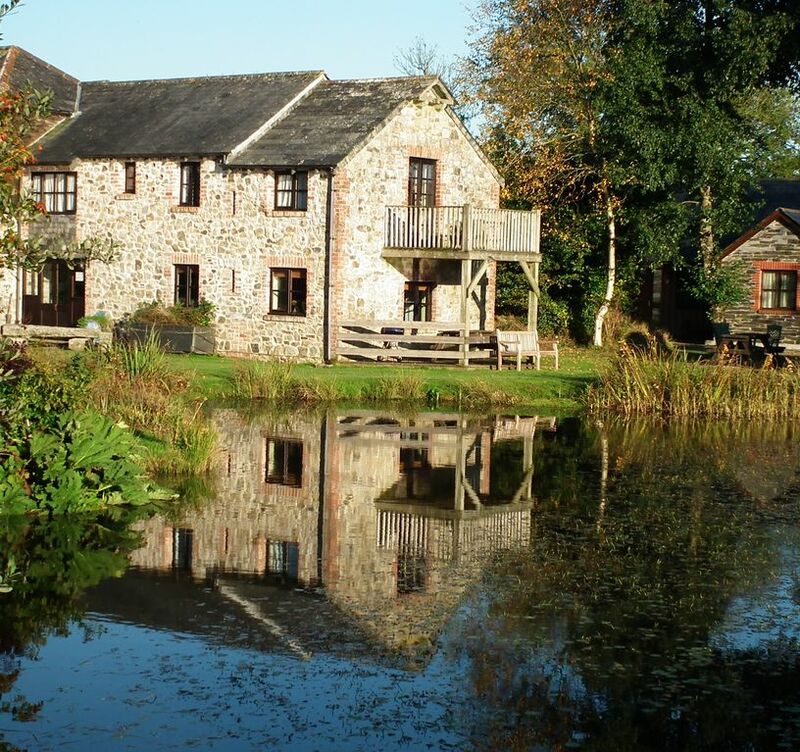 There is plenty to do at Trehill with three fishing ponds, a heated outdoor pool . There is also a games room, and many other outdoor activities. Lakeside is spacious and very well furnished. From the large upstairs balcony you have superb views over the Cornish countryside. There are slate floors and low beamed ceilings in the lounge area, a large leather sofa with matching arm chairs perfect for slumping into after a hard day out. There is a good quality colour TV with DVD player and CD stereo. There is also ample electric heating (included) as well as a real gas fire. The kitchen is modern and bright with stainless steel over and ceramic hob for fast and controlled cooking. The kitchen also benefits from a new dishwasher, washing machine, fridge/freezer and microwave. The pleasant dining area is Very light with direct views over the lake. Or why not have a BBQ & eat outside on your lakeside picnic table! Bedrooms and Bathrooms. The upstairs living areas are fully carpeted with tiled bathrooms. The main bedroom is extremely large. There are French windows leading to the large and very sunny balcony. On a summer’s evening you can sit and watch the sun setting over the distant hills. There is a double bed, built-in wardrobe and dressing table. The second bedroom has two single beds. There is a large bay window looking out onto the courtyard and lake. A built-in wardrobe and chest of drawers give plenty of storage space. Bedroom 3 has one single bed. There is also a wardrobe with drawers. All bedrooms have thermostatic heaters and the downstairs areas have a combination of electric and gas heating. Upstairs balcony with wonderful lake & country side views. The China Fleet club is approximately 15 minutes away Also free use of the stunning new Aqua spa at the nearby China Fleet club. 4 adult & 4 child memberships included. Please note that many of the available facilities (tennis, indoor pool & fitness centre / spa are available at the nearby China Fleet Club (free memberships are included. There is an outdoor pool (seasonal), games room, fishing on site. Lovely cottage and the fishing was a huge hit! The cottage was very clean and tidy with everything you need for a home from home. It was lovely and warm which was a huge relief as the weather was pretty cold during our stay. The weather, however, did not stop us all from wrapping up warm and doing some fishing. We had purchased some rods from a friendly shop in Liskeard called Fishing Mayhem (based in Golden Bank Nursery & Garden Centre). The fish in the lakes loved bread but another guy fishing was catching a crazy amount of fish using pellets (very smelly and looked like jelly) so get some of them! The games room was a little different to the photo (the arcade game had gone) and the electronic dart board was pretty lame but we spent about 40 minutes playing on the table tennis and air hockey. Snowy the donkey was hilarious and we all enjoyed watching it bucking and running about like a nutter! Very funny! The location was remote and so it was quiet and peaceful. The travel cot smelt a little musty and the highchair had mouldy straps so I think they had been in storage somewhere a little damp but I had some sterilising fluid with me so cleaned it off before use. We really enjoyed our stay but things that would have improved our experience would have been clearer instructions on what to do when we got there and where to park our car; a little welcome box maybe (some biscuits/milk? ); info about local shops/take-away/places to eat/etc (leaflets); labels on the many switches outside the bathroom to identify what they do; a washing up sponge for the dishes and some hand soap in the bathroom would have been nice as I hadn't packed these items. Hi Ayesha, we are delighted you had an enjoyable stay. We are sorry about the picture of the games room. Sadly arcade machines are almost impossible to repair these days. We will get new photos shot immediately. The dartboard is a difficult one. At Trehill cottages we are delighted that children are able to explore the grounds and use most of the facilities without parental supervision. This does mean compromises and a dartboard with sharp steel tips would be one of them. Alas, the child friendly dart board is just not as good as a proper old fashioned one! But it is a lot less likely to result in serious injury! - Welcome packs are a tough one. We used to provide a mini welcome pack, but as dietary requirements changed and as potential allergies increased, we no longer felt comfortable offering guests basic items on arrival. There is a very good local shop in the village about a mile away (open very late thankfully!) and a Tesco, less than 5 minutes away. Once again thank you for visiting Trehill cottages and we would be delighted to welcome you back in future! Very quiet, property has everything you need. Almost 100% certain to catch fish (lots). We are liable to be coming back! A great holiday as the weather was brilliant. The cottage was lovely with great views, a friendly donkey and it was a nice setting. The only criticism we have is attention to detail in regards to maintenance and house keeping after people have left. Stayed here with a group of friends from work. We were in the lakeside cottage which was very nice with lots of old world charm & a nice position by the lake. We enjoyed our short break in Cornwall. the cottage was very well equipped and comfortable. The grounds were lovely and the fishing was fun. I caught a 15 pounder on my last morning. We didn't get to the China Fleet club but it certainly looked nice. Golf Breaks at St Mellion. To upgrade to a full golf and leisure package at the world renowned St Mellion club, simply add £100/wk to the holiday price per person at St Mellion or play great golf at China Fleet for just £35. Trehill is perfectly positioned for a touring holiday, being within easy reach of both North & South coast. There is so much to do that no space could take it all in. Here are a few of our favourites! Camel Trail:- Cycling the camel trail from Wadebridge to Padstow. A gentle route along the beautiful estuary, a quick lunch at Rick Stein's cafe on the harbourfront and a gentle ride back. . Easy ride, superb views. Hire at Bridge Bikes in Wadebridge. Looe:- Looe is a busy traditional fishing village about 20 min. .
Rates do vary week by week so please use our seasonal rates as a guide only. This especially applies to public & school holidays which are likely to be higher than the 'rate' for that season. Christmas & New Year count as peak rates. The changeover day is on a Saturday. During the off season we may consider other start days. Short breaks are available October to April. 3 nights cost 70% of the weekly rate, 4 nights 80%.